On the IMPACT! program we run for leaders who want to make a positive difference, we take the time to explore some of our personality traits and differences, and, if we want to explore even further, we then get an online assessment of our own personality preferences. If you are interested, we have 3 online products depending upon your role for getting this highly insightful report. Of the thousands of people I have personally helped, this profiling tool is one of the most significant resources you can acquire. click here to access our C-me Color Profiling page. 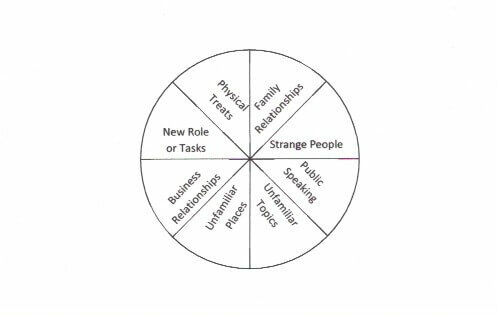 The report when used properly helps us immensely to become more aware of our strengths and weaknesses as we relate to others, how best to communicate to those who are "wired" differently. Even if you have had some assessment before, I can assure you the C-me profile will prove invaluable. Please let us know if you want to explore this further by visiting our website by clicking here. Next we make the commitment to apply some proven guidelines to build more effective relationships, gain ever greater co-operation or attempt to influence others to adapt some of their intransigent attitudes and behaviors that are sabotaging their ability to get the results with people they want. If you have read some of my previous blogs on the Cycle of Experiential Development, You'll realize this takes real effort, so we ask someone else to hold us accountable, and check up with them frequently during the program. This one series of exercises alone is so vital that it makes participation on the program well worth the money, time and effort. If you are interested in registering for this dynamic, life-changing program, please drop me an email or comment. Next time we'll explore the "M" in IMPACT! -- Mental Toughness and Self Confidence. I get emails and invites frequently encouraging me to "become accredited to use a fantastic tool that helps people measure their emotional intelligence." I first remember being exposed to "emotional intelligence" when I read Daniel Goleman's book of that title. It was very insightful and I am pleased I read it. I had observed from many years working with people who wished to develop their interpersonal skills that being more self aware was a vital element in being able to understand our own behavior as well as the behavior of others. Then, we are more likely to be able to adapt and connect with them more effectively. Through Dr Goleman's study and explanation of how the brain works we more fully understand the neurological processes which can help explain why we do what we do when we interact with others. Dr Caroline Leaf in her book, Switch on Your Brain , further explains that we need to develop both our interpersonal as well as our interpersonal skills if we are to produce a life of health and happiness. Interpersonal Intelligence, a term I have coined I believe captures both. We begin to use our understanding of why we do what we do to adapt how we interact. Interpersonal Intelligence explores what it takes to build effective relationships, gain enthusiastic co-operation and even influence people to change the way they act and do things which cause offense or are counter-productive to building lasting relationships. My reflections upon reading his blog were how it reminded me of my early days in training and development with Dale Carnegie Training. We were taught to link the Logos (Facts) Chris speaks of to the Pathos (What's in it for me) benefits in our language so our person(s) to be influenced can easily bridge the two. In my book(click here to purchase), IMPACT! Chapter Fifteen is devoted to developing 7 ways to construct what we present so that we can persuade our audience to accept, digest and even act on our message. Thanks again, Chris, for taking the time to share! What Makes IMPACT! So Special? I have had the privilege to train and work with thousands of people over the years, and heard many Lucy W stories. Even today I heard from a client who had experienced how some people I trained to be coaches were running a series of workshops on giving effective feedback, and the coaches referred to their experiences of learning the IMPACT! core skills as the foundation for what they were doing. IMPACT! in essence is both a book and a program. It could be described even as a lifestyle and way of thinking. It permeates every aspect of who you are and turns you from a follower into a leader, from a victim into a victor. For those of you who already know you are leader, it equips you to become a transformational leader who develops other leaders. For the first time ever, I am going to be running an Internet IMPACT! Program. It is going to be a series of 1 hour sessions for up to 5 people. First of all it starts with a 1 to 1 coaching session to determine what it is you want from participating on the program. Then 7 X 1 hour video conferencing workshops where we tackle the material in the program and handouts provided, and conduct live coaching. Then a 1 to 1 coaching session at the end to help pull everything together. It's all for the introductory price of $500! Normally, the cost is $1500, but as this is the first, you get a great deal! To register or get more information please leave a comment or subscribe via email. What does the Law of Steady State have to do with learning? About a year ago, as we were working on the final stages of our basement remodelling, I was in our car on my way back with supplies from our local DIY store. I came up to a stop sign on a busy interchange of roads -- there were 6 lanes altogether. As I looked west, I could just see the sun disappear of the mountain range, and thought how wonderful it is to live in Colorado. I was intending to cross straight through the intersection, so once the oncoming traffic cleared, I promptly drove out into the thoroughfare where there was a median with trees and bushes slightly impeding the view of traffic coming 90 degrees to the right of the direction I was travelling. You guessed it, I proceeded just in time to see a car coming quickly from my right. i swerved my car violently to the left, but the torque of my forcing the car onto the left side and the oncoming car's hood hitting it about wheel high flipped it over for 270 degrees! "What a ride", I thought as we tumbled, just like my flying days! Very fortunately no one was hurt badly, and it certainly disrupted my "steady state". Question: What do you think it did to my next few driving experiences? I had gone outside of my comfort zone by accident (pun intended), and the catastrophic event affected my driving. In the short term, my comfort zone shrunk. But, because I know how damaging it can be to not "get back up on the horse once you fall off", I began driving again, and needless to say took fewer risks. Even now, a year on, my driving conscientiousness has improved as I learned from the experience. The Law of Steady State says that there is a universal principle, like the Law of Gravity, which says a body, a situation, group of people, etc., tends to form a steady state, a norm, or a rhythm which allows it to exist in that state. Physicists may refer to it as "Newton's Law", expressed in a formula, F=MA. (Force equals Mass Times Acceleration). When anything comes along (stimulus) to disrupt that steady state, the object, person, group etc. will seek once again to reform into a new steady state. The universe, it seems does not like high volatility. Whether it is the stock market, governments or parents with children, we all dislike unpredictability and constant change. As I write this we are experiencing a new President of the United States, who is bringing about many volatile changes to "the way things are normally done". The protests are coming from all over the political spectrum, because he has disturbed the status quo. How does this apply to learning? In order to get us to see things differently and actually become aware there is another way of seeing/doing things, we very often need to have our "steady state" become unsteady. The best leaders, teachers and professors patently understand this, and will deliberately disrupt the norm to get our attention, before they go ahead and help us explore how to "fix" the problem caused by the provocation. Once out of our comfort zones, we'll grab at any plausible "how to" that might get us back into a steady state. Here's an example: Someone asked me recently how they could improve the relationship they had with a partner. Once we discussed what they wanted to improve and why, it was concluded by this person that the problem was the way they listened. To get this person out of their steady state I asked them to describe what happens currently, and what the consequences were. This pictured in the mind of the non-listener a very uncomfortable situation that no longer was acceptable. They became uncomfortable with the steady state and wanted it to move on badly enough they were very open to explore new ways of improving their listening. From a coach or mentor's point of view, the real work was already done. We had helped the person to dislodge their steady state in how they related with a significant other, and then once aware that going back to their old way was not a good option, they became very open to explore new and proven ways. Something tells me, if properly re-inforced, this person will make significant strides to create a new steady state of listening and therefore relating to others. It is the Cycle of Experiential Development in action. 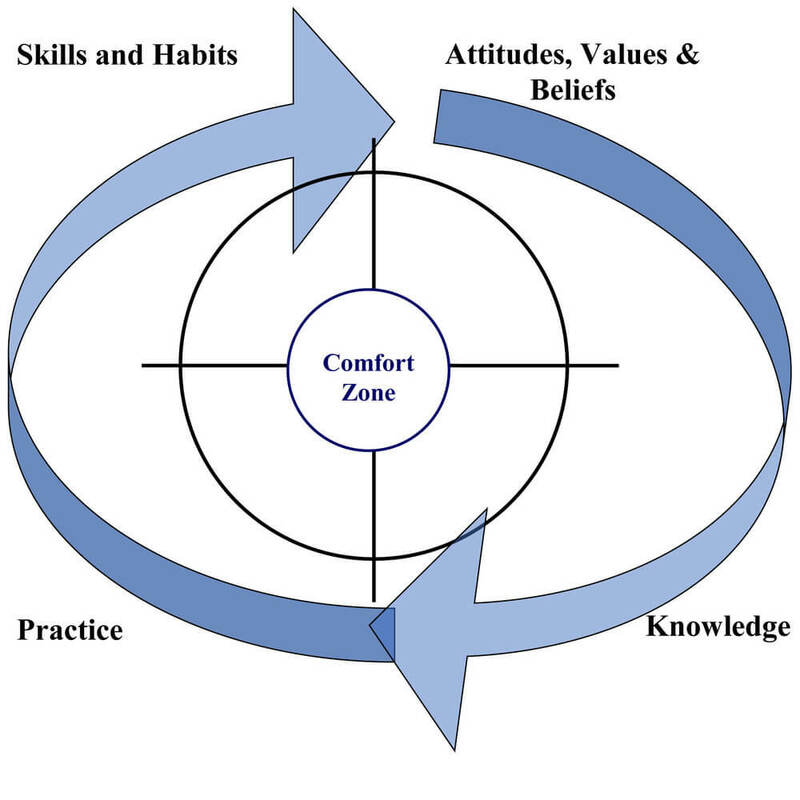 The change in attitude by the person wanting to be developed led to exploring some new ways of behaving outside of their comfort zone. They so did not want to go back to the way things used to be that they were committed to practicing something new. If the new way of behaving yields positive results, what are the chances the person adopts this new behavior more often? Exactly. They now have a new level of steady state which includes a new skill for relating well with others. What is Your Leadership Doing to Others? "Geo, are you aware of the damage you are doing by behaving the way you are? Your classmates look up to you as a leader, and model your behavior. You find school easy, and excel at sports, so you can afford to not take class seriously. But they cannot. You may be the factor which causes them to fail. The type of leadership you are displaying is disrupting and irresponsible. It is about time you shaped up, took your responsibilities seriously and made a positive impact instead of a negative one." Strong words spoken to a 14 year old from a small town in rural America. Those life changing words were administered to me by Mr Wayne Wallace, my coach and geometry teacher at Burwell High School back in the 60's as he peered straight into my eyes and through to my soul. I was late for practice one day because I had been kept after school for disruptive, noisy behavior. I was stunned, hurt and yet at the same time very surprised -- Mr Wallace thinks I am a leader! He says I am someone others look up to! So after my punishment for missing basketball practice for disrupting Mr Matheson's chemistry class, Something snapped inside of me. i resolved to do things differently. Overnight I made a decision that if someone as smart and successful as Mr Wallace did respect me as a leader, even though I was just the 3rd son of a farming and ranching family from a small Nebraska town, I could make a positive impact. And I did -- I became the president of our student union, captain of our football team and honorable mention All State. I was a member of Burwell's first ever team to go to State Tournament in Basketball, a Regent's scholar, valedictorian of our class, and the first person to be accepted to attend the United States Air Force Academy from our school. For the past 50 years I have tried to be a Mr Wallace for others who are ready to step up and make some changes. All because someone took me aside and challenged me to make a positive rather than a negative difference. What about you? What are your God given skills, gifts, dreams and ambitions? There has never been nor will there ever be anyone just like you! 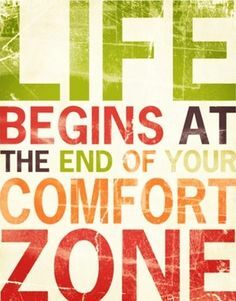 What out of the comfort zone steps could you take to further your IMPACT! on perhaps millions of people around the world. The cure for cancer may be in your hands. You may be the person who brings hope to the millions of kids who go to sleep with swollen bellies due to malnutrition. If you would like information on how to make a positive difference in your world, you have some options. Read and put into action the outlined steps in my book, IMPACT! How to Make a Positive Difference. Just lick on the IMPACT! link below to order the book. So staying inside our comfort zone for too long or the wrong reasons can be really bad for us. What about the opposite? How about if we venture forth into a place where we are uncomfortable or lacking in confidence so much our trepidation turns into panic or terror? There is a place of grave danger physically, psychologically or spiritually or all three. It can be in any of the segments we mentioned earlier. It is in that place where we are totally out of control, well beyond our abilities or experiences. It results in panic or terror. Usually, this out of comfort zone area is caused by some external force of nature or person(s), like in an earthquake or terror attack. Because we are not trained or ready for these events, we experience high levels of fear trauma that sears our soul. I went to the scene of a wrecked airplane in combat one time, where people I knew well were burning to death if the crash had not killed them first. I just could not get myself to approach that airplane to help. Even now it sends my heart racing as the image of that tragic scene flashes before me. Heidi, my wife I love dearly, suffered a similar experience when a car travelling just ahead of her crashed into a semi-trailer truck (or lorry, if you prefer) that left the car cut in half. "For many years afterward", she says, "I hated travelling by car down that road. It took both time and prayers by friends to set me free from that fear." Nowadays we call it PTSD, or Post Traumatic Stress Disorder. So here we are -- staying inside our comfort zone can be harmful, and going too far outside can lead to us running back to the safety zone and building a barrier or wall around ourselves which again traps us inside. What a dilemma! How do we then venture into that space where life really is? What are your first thoughts about what we could do? Please take a few moments and reflect upon courses of actions or thought patterns which may help us live life at the end of our comfort zone. So if we cannot safely stay in our comfort zone too long or too much of the time, in our different areas of our lives, and going out too far or finding ourselves thrust out there by people and circumstances, can also prove to be a disaster, what can we do? We need a way of systematically growing our areas of comfort and confidence that builds us up, makes us better, and helps us achieve our God given purpose in life. We've got to look for the stretch actively, and in meaningful ways even though doing so makes us feel uncomfortable and at times we fail miserably. Maybe for you it isn't learning to swim or finding meaningful work, yet all of us, I believe, have areas that are calling us to venture into in our lives that will yield great rewards and sense of satisfaction. That is why understanding and personally applying the Cycle of Experiential Development is so important. Our next blog will begin to help us on our journey of finding practical ways of expanding our comfort zones that minimize the risk of failure and lead us to a life of adventure in all areas. Why don't you join us as we explore this fascinating and life changing concept? What Comfort Zones Do We Have? We might find certain segments mentioned place us outside of our comfort zone more than others. Yet if we have a failure in one area outside of our comfort zone, it can affect the boundary of our whole zone. We might even find we begin to build a wall around the whole thing. This could lead to the downward spiral we spoke of in the earlier blog. On the other hand, if we have what we deem as a successful venture, it can lead to us being more confident in other areas as well! As you reflect, where has your comfort zone shifted either outwardly or inwardly recently? What impact, if any did it have on other areas? We'll explore next blog as promised what happens if we stay in any one of our comfort zone segments too long.